November 2012 marks the 3rd blogoversary of my nail art blog -- Simply Rins. And I can't believe it has been 3 years since I first published a post here. As you may know based on my About Me page, this online space started as a personal journal of my life. I was lost to what direction I wanted this blog to take. After more than a year, I finally found its purpose -- to share my passion for nail art. And so the journey began. It has been a bumpy ride and there were times that I felt low on how some people treated me and my craft. But eventually I found myself in a community that supported me, that appreciated what I had to share, and that gave me the push I needed to just keep moving forward. 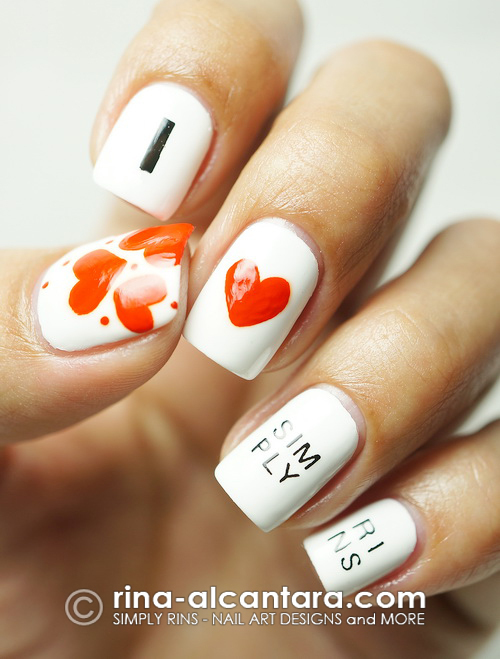 Since the beginning, this blog aims to give inspiration to nail art enthusiasts everywhere. The friendships that followed came as a surprise and I treasure each one of you that took time to read, to comment, to like, to share, and to send me wonderful messages of all sorts. I am deeply honored. 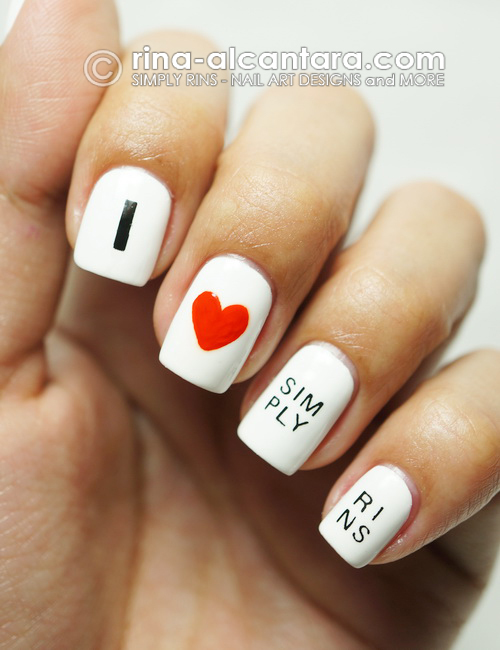 I decided to create a "I Love Simply Rins" nail art design to celebrate the blog's 3rd year anniversary. I thought my nails looked like a shirt after I painted this design. This blogoversary nail art is personal to me because I now have a deeper relationship with my blog. We are in love. WHAT?!? What I meant to say is that I've grown to love Simply Rins and its loving me back in a lot of ways. P.S. I'm trying to organize a nail art contest that would be open to both local and international readers of Simply Rins. I'm still finalizing the prizes and hopefully will be able to get sponsors for additional loot! Stay tuned! Congratulations. I love Simply Rins because her work is so precisely and original. Your blog is a huge source of inspiration to me. Thank you for all the dedication and hard work you put in to making this blog what it is. Congratulations! <3 Best wishes for many more years to come. Yay! Happy Birthday Simple Rin! Your mani is so cute!! Happy blogaversary! Thank you all very much for the greeting.